This year’s event is projected to surpass the 30 teams that participated last year and reach 50 by the time the tournament is celebrated March 2-5, 2017. 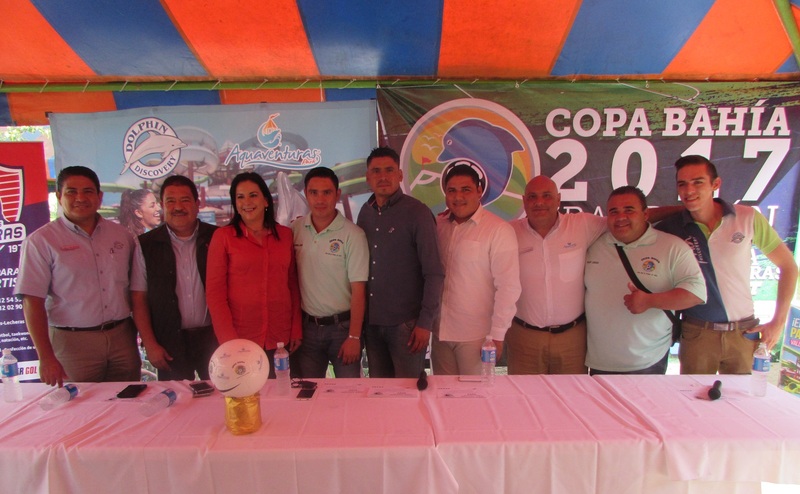 The press conference announced the third edition of the Bahía Cup competition with the slogan “Because Soccer Is Everything.” The president of the event, José Angel Aguiar, shared the event details accompanied by local authorities and official sponsors, including the Riviera Nayarit Convention and Visitors Bureau. To date there are 15 teams confirmed from different states including Nayarit, Jalisco, Chihuahua, Veracruz, Baja California and Durango. There are 10 categories for teams ranging from four years of age to a free category for players over 17, including female, male and mixed categories. A new category is the penalty tournament for dads. This year’s event is projected to surpass the 30 teams that participated last year and reach 50 by the time the tournament is celebrated March 2-5, 2017. The host fields will be at the San José del Valle, Bucerías and Jarretaderas sports centers. The distinguished guests who made this event possible included educator José Antonio Plácito, coordinator for section 20 of the National Union of Education Workers (SNTE by its acronym in Spanish); educator Lourdes Ibarra Chiquete, director of the Culture, Sports and Education department of the Bahía de Banderas City Hall, and her sports coordinator, Francisco Navarrete. The press conference took place at the facilities of the Aquaventuras Park, official sponsor of this year’s event; the park’s new General Manager, Daniel Manzanares, and his predecessor, Mario Domínguez were present at the event. The host hotel will be Las Palomas in Bahía de Banderas, and there are an additional seven hotels that will also offer special rates for the teams. The registration cost is $3,000 pesos per team; there will be awards, medals and even cash prizes as long as the minimum number of teams registered per category is surpassed, per the clause. One of the top incentives for young talent is the presence of professional team scouts. You can follow the event details here: https://www.facebook.com/CopaBahiaBBRV?fref=ts. For more information email: copabahia@hotmail.com.